In spite of Indian Wells’ remote desert location, today’s order of play promised the most fertile day’s tennis in weeks. Enticing match-ups threatened to bloom across three stadium courts, assuming they were provided with sufficient light and care. Alas, what began with promise finished up as a salutary lesson in being careful what you wish for. By and large, even those matches that did flower gave forth fetid blooms. It wasn’t the conditions, since those were perfect. It was mostly an issue of over-fertilisation. Things got off to a noisome start on Stadium 2, as Andy Murray and Jiri Vesely set about establishing the heroically excremental tone that would saturate the day. Murray generally struggles at Indian Wells, although one strives in vain to tease a common element out of his various losses. 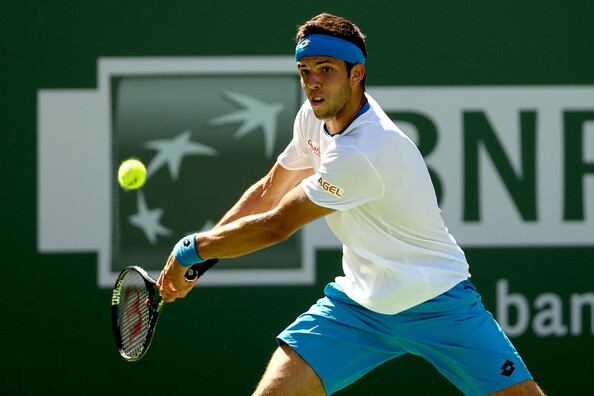 Last year provided a relatively green patch, as he reached the quarterfinals before falling to Juan Martin del Potro. Two years ago he lost his opening match to a rampant Guillermo Garcia-Lopez. The year before that he fell in the same round, losing with dismal single-mindedness to Donald Young. Today Murray appeared less committed to losing. At times, particularly at the commencement and the conclusion of the match, it almost looked like he wanted to win. He led by a couple of breaks in the opening set, although these didn’t take root, and Vesely climbed back to take it in a tiebreak. The Czech led by a break in the second set, but found creative ways to hand it back. Much the same thing happened in the third set, thereby providing Vesely with a ‘valuable learning experience’. Being young and impetuous, he’ll probably appreciate the lesson less than a win. Sky Sports, turd-polishers par excellence, again proved themselves adept at overstatement, insisting that the match had ‘had everything’, and had been a showcase for Murray’s ‘champion qualities.’ Statistics don’t always tell the full story, but sometimes they refute the wrong one. In this case they tallied well with the visual evidence, which consisted of a densely compacted trash-cube of crucial double faults, jittery errors, dozens of break points, sub-par serving and vehement self-excoriation. The soft patter of sparrow dung was soon drowned out by a downpour of clichés. The BBC had it that Murray both dug deep and survived a scare, in much the same way that a stranded hiker will excavate a foxhole to ward off exposure. Robbie Koenig chimed in to the effect that champions find a way, but failed to mention that the way in this case was a dung-slimed path paved with his opponent’s double faults. Still, lesser players have gotten lost. Even as Murray and Vesely braided the clean desert air into ropes of ordure, Federer and Tursonov were providing a rather better spectacle on the main stadium, although this isn’t saying much. Federer led by a break in the first set, and served for it, but forfeited the advantage and slunk to a tiebreak, which he narrowly won. Tursonov surged into an early break in the second, then immediately reversed out of it. Another tiebreak hove into view. Both men were playing decently, and sometimes well – there will always be winners and bold moves forward with this pair – but rarely at the same time. Federer took the second tiebreak quite comfortably, and that was that. It is Federer’s eight victory in a row, and he’ll next face Tommy Haas. By this time Stadium 2 had been attended to by a bio-hazard crew armed with fire hoses, although nothing could quite scour clean the noxious vibe. Into this cauldron of bad faith and broken dreams ambled Fabio Fognini and Gael Monfils, unequalled masters at the art of transfiguring beauty into dross, and then back again as fancy strikes them. (Monfils, with Gilles Simon, once rendered Hisense Arena all but unusable for weeks.) Initially it was a surprising match, in that the higher-ranked Fognini quickly set about building a commanding lead, much as a normal tennis player might. There were a few characteristic flourishes towards the end as he blew a handful of set points, but overall it was a disappointingly assured performance. Monfils predictably roared back in the second, and maintained his momentum into the third. This was more like it. The Frenchman eventually served for the match at 5/4, threw in a double-fault on match point, and then another two points later to be broken. Fognini was now in his element. ‘Quite incredible’ remarked Koenig conversationally, for form’s sake. His uncharacteristically sedate tone suggested it was anything but incredible. If he was conserving his larynx for the tiebreak, he needn’t have bothered: Fognini held, and then, via a sequence of soft Monfils errors, broke to love to take the match. It was anticlimactic, but only if you were expecting a climax. Dramatic matches can grow burnished with time, regardless of their actual quality. Stanislas Wawrinka and Andreas Seppi fought out a memorably awful match in Rome two years ago, with the Italian eventually saving half a dozen match points. (Venue and personnel count for a lot. Seppi was an Italian playing on Petrangeli, one of the great tennis courts of the world, before a partisan crowd always eager to give itself to frenzy. The fact that the match was a timorous, leaden-handed disaster hardly matters. Indian Wells, for all its new money and self-proclaimed status as a fifth-slam, lacks that kind of cache, and certainly lacks a local crowd as committed to lunacy.) There was little chance they’d reprise that match today; Seppi isn’t quite the same player he was, while Wawrinka is now a Major champion and playing like it. That’s pretty much how it played out. Wawrinka triumphed 6/0 6/2 in under fifty minutes, the kind of performance we’ve learned to expect from a Swiss number one. While Kevin Anderson gradually dug himself a deep foxhole against Evgeny Donskoy, Rafael Nadal and Alexandr Dolgopolov made their way onto Stadium One for what was fated to be the match of the day. So far this year Wawrinka is the only man to defeat Nadal, a result that was especially surprising given the Swiss had never won so much as a set from the Spaniard before that. Dolgopolov also hadn’t won a set from Nadal, although the last set they’d played – a tiebreaker in the Rio final a few weeks ago – was the closest he’d come. There was some hope that he was finally due – this was not a hope officially sanctioned by Nadal’s fan base – although I doubt whether anyone seriously believed the Ukrainian would manage to win two sets. Victory appeared unlikely. The opening salvoes did little to convince otherwise, though they also suggested that neither man particularly covets his own serve. Breaks came and went, as did Dolgopolov’s challenges. He had none left after two and a half games. The breaks soon gave way to holds, but for one last surge from Dolgopolov. He saw out his first ever set over Nadal with nary a trace of nerves, his first serve percentage soaring into the high thirties. Indeed, it was the kind of nervelessly virtuosic performance that Dolgopolov is notorious for; flat, bold hitting, painting the lines and exposing Nadal’s forehand corner with uncounterable crosscourt backhand drives, timed exquisitely. The Spanish commentators, models of objectivity, took to declaiming ‘afortunado‘ after Dolgopolov’s better points. One assumes they were referring to themselves, and simply felt lucky to be witnessing the Ukrainian in full flight. It was also the kind of tennis Dolgopolov notoriously cannot sustain. Nadal turned it around in the second set, mostly by tightening up his groundstrokes (length was an issue in the first set), and muscling his opponent around and off the court. When he took the set 6/3 it seemed as though routine patterns had been re-established, and equally clear that he’d go on with it. Somehow, though, he didn’t. Dolgopolov, slave to the mad clockwork in his brain, began to hit out again, and broke. From 5/2 up, however, he began to hit out in earnest – often metres out – while Nadal refused to miss. Dolgopolov, inspired by Monfils, broke himself to love in lieu of serving out a famous upset, thus convincing at least one onlooker that the match was essentially over. It was a mercy when he held serve and forced a tiebreak, and a miracle when he kept the breaker close. The score flopped around listlessly for a while, mostly due to Nadal’s unwillingness to sustain a lead. A disastrous forehand approach by the Spaniard at 5/5 permitted Dolgopolov a match point, which he took with an ace. Nadal challenged. Hawkeye, having finally achieved sentience on the worst of all days, caught the prevailing mood perfectly and decided Dolgopolov’s serve had missed by a few millimetres. The miracle here was that Dolgopolov maintained his composure, made no complaint, landed the second serve, and then assembled an excellent point. It turned out he could win two sets, and thus a match. He looked ecstatic, and his father overwhelmed. Nadal afterwards proffered no excuse beyond a gracious concession that his opponent had played better. And with that, the defending champion is out. Whether it was a bold, fragrant upset or a hillock of crap is, naturally, a matter of perspective, just like the day itself. Hahaha. That was sooo good. I was chuckling the entire time but this-it droppeth as a gentle rain of sparrow crap-this broke me. I needed this post to lift my spirits after a few days akin to Andy Murray’s sparrow crap of a match, so thank you very very much. Excellent. Glad I could lift spirits. Jesse, thanks! You are great! I know you know we love your writings. Thanks very much, Marcia. Actually, I’ve fixed so many typos that it’s almost worth reading it again.